Visit us in Cherry Creek North. work of art for your home or office. 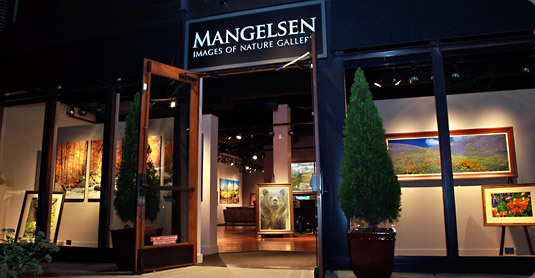 MANGELSEN—Images of Nature Gallery opened in Denver's prestigious Cherry Creek North February 14, 2007. This charming, pedestrian-friendly neighborhood is home to over 320 galleries, boutiques, restaurants and spas, and is often recognized among Denver's best amenities due to its delightful ambiance and Denver's largest collection of independently owned shops. With over 40 restaurants and cafes, Cherry Creek North is the place to be and be seen! For the savvy shopper, art lover, or 'foodie' begging for a thrill... Cherry Creek North is a must. The sixteen blocks of Cherry Creek North are located just five minutes from downtown Denver where you will find the Denver Center for Performing Arts, the Colorado History Museum, Denver Botanic Gardens, the Denver Art Museum, Elitch Gardens (the only downtown amusement park in the country) and major league baseball, basketball, football, hockey and soccer teams. And, of course, the nearby 14,000 foot high Rocky Mountain playground is just 30 minutes west. We invite you into the gallery where you can, at your leisure, view the Colorado Rocky Mountain's White River National Forest, the Raggeds Wilderness Area, and the Yampa River... as well as experience the many wild places of the natural world as seen through the lens of legendary photographer, Thomas D. Mangelsen. We look forward to hearing from you! Contact us with any questions you may have. We want to provide you with the best experience possible. Photos of MANGELSEN—Images of Nature Gallery and surrounding areas courtesy of Denver Metro Convention and Visitors Bureau, Steve Crecelius, and Sue Cedarholm. With 650 species, the 80 acre zoo is within 15 minutes of Cherry Creek North, and became the first in the United States to use naturalistic enclosures rather than cages and bars. Providing natural and cultural history exhibits and collections, an Imax Theater and the Gates Planetarium are a must see! Just 15 minutes from our gallery. Located only 5 minutes away, this fantastic Museum displays collections as well as temporary exhibitions. The architecture in and of itself is phenominal! Located in the Inn at Cherry Creek, the districts boutique European style hotel, The Weber features fresh local cuisine paired with fine wines of the world. Brio’s villa-like interior with the taste of Tuscan bliss is the setting for a menu with an emphasis on prime steaks, chops, homemade pasta specialties and flatbreads prepared in an authentic Italian wood-burning oven. Rated as "Best Steakhouse in Denver" by 5280 magazine and created by the man himself, Elway's in Cherry Creek is the place to celebrate "life's victories". Executive Chef , Tyler Wiard's crafted menu of upscale appetizers to everyday favorites is uniquely Colorado. A meal at Elway's is a touchdown in fine dining. Click here for directions and a larger map.